The villa is less then 1 mile away from a district of Montaione, situated in a central position between Siena, Florence and Pisa. Deluxe Tuscan villa set in a central location within only 15 minutes drive from San Gimignano and in a range of 40 minutes drive you can reach Siena, Florence, Lucca and Pisa. The manor house is immersed in a very old family owned estate, surrounded by vineyards, olive groves and a huge lush park, offering privacy, seclusion and limitless views of the typical Tuscan landscape. The farm is an ancient property which dates back to the year 1000 A.D., set along the pilgrim's road connecting France and Rome, the Via Francigena. Right in front of the villa you have the stunning pool area. 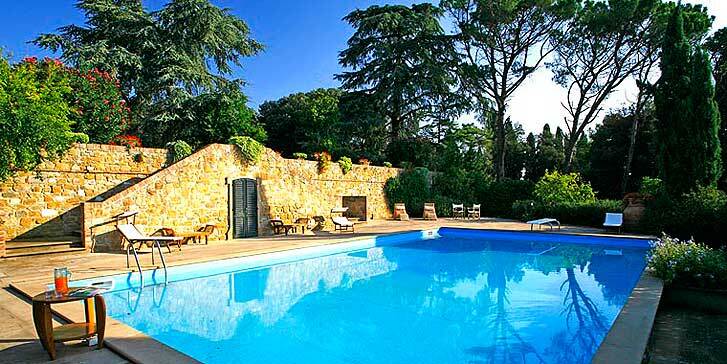 The swimming pool (9 x 14 meters) is exclusive for guests and is surrounded by a completely furnished solarium where to catch some of the Tuscan sun while relaxing with a glass of wine and the wonderful views downhill. The pool area is equipped with comfortable sun beds, sun umbrellas, reclining chairs and many areas where to eat al fresco. In addition you have a loggia with dining table and seats for the whole group ideal for outdoor meals. Right besides the pool there is also a dependance with changing rooms, shower cabin and bathroom. The house is simply wonderful, built of stone in a typical Tuscan architecture, situated in the heart of the estate. The interiors are really spacious and comfortable offering many rooms, accessed also by Frech doors directly from the surrounding garden. The entrance hall leads to a sitting room fully equipped for entertainment with SAT-TV, DVD, HI-FI stereo system. From the entrance hall you can access also the main living room, a wide living area featured by its typical archways, vaulted and very high ceilings and terracotta floors. The living room is connected with the billiard room as well as with the library. To the opposite way you can reach the dining room, furnished with a large dining table for the whole group to come together for delicious Tuscan meals. Close to it is set a hunting room, with the original open fireplace – once upon a time used also as a kitchen. The modern kitchen connected to it is fully equipped with all necessary appliances and useful utensils you might need, like microwave, large refrigerator with freezer, electric oven, large stove, dishwasher. On the ground floor is set a guest bathroom with WC and sink only. The first floor holds all bedrooms and the remaining bathrooms. There are two double bedrooms each with their own private en-suite bathroom fully equipped with shower box, WC, sink and bidet. One double bedroom with an adjacent private bathroom, with shower, WC, sink and bidet. In addition, on the first floor there is one twin bedroom and one double bedroom sharing one complete bathroom with bathtub, shower, WC, sink and bidet. Besides, another twin bedroom and one single bedroom share a bathroom with bathtub, sink, WC and sink. All rooms are charmingly furnished with great taste, respecting the traditional Tuscan style, with many antiques, original family pieces of furniture and objects which create a welcoming atmosphere like your home away from home and back in time! For this, you don't have to give up the modern comforts, like air conditioning (in the bedrooms only, paid extra if needed! ), SAT-TV with DVD, CD player and HI-FI system, WIRELESS INTERNET connection and all kinds of appliances and services. Villa Palmira is the ideal base for groups of up to 13 people looking for a relaxing vacation in Tuscany in contact with nature, secluded yet so close of the charming little towns and the best attractions of this Region, like San Gimignano, Pisa, Florence, Siena. The villa is situated only 1 mile away from the closest village of Montaione, where you will find typical restaurants, a grocery shop and a tennis court. The golf course of Castelfalfi is only 5 km away. Besides, from the villa you can visit many Chianti wineries all around. SPECIAL SERVICES: This villa includes maid service for 6 days a week (except for Sundays) for 2 hours a day (10 am - 13 pm). It is possible to hire housekeeping services for extra hours, a chef who comes in the villa to prepare welcome dinners, special celebrations, Tuscan style breakfast and all kinds of meals according to your needs (to be arranged directly with the owner upon reservation). Besides, it's possible to hire shutlle service; guided tours, wine tasting, baby sitter and laundry service upon request. PLEASE NOTE: Electricity is included up to 300 KW (further consumption is charged 0,45 € per KW) and air-conditioning is paid extra 10 € per day (present only in the bedrooms).